The trees on Lyon's squares are budding and will soon be in full bloom, meaning that soon we'll be able to enjoy their splendor in outdoor cafes. 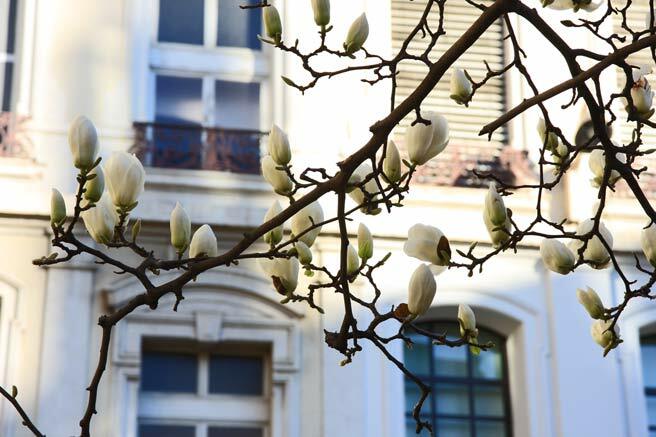 The cherry blossoms that envelope Place Francisque Régaud in a gorgeous canopy of blossoms in front of the Grand Café des Negotiants and Café Perl in the 2nd arrondissement haven't bloomed yet but will any day now. It might be worth your while to swing by (metro Cordeliers) and check it out within the next couple of weeks, and enjoy lunch or a refreshment there if the weather is nice. Weekends are destined to be packed and tense with people scheming for tables, but know that the trees don't close up shop after Saturday and Sunday. At the same time, you can enjoy your own version at home by picking up what looks to be the bunches of bare branches currently for sale by many of the farmers at the outdoor markets. The branches are trimmed from a variety of fruit in the orchards surrounding Lyon, and feature an exciting array of colors and shapes in the blossoms that come out of them. All you have to do is put them in water at home. Watching them unfold never ceases to enchant and amaze. But I can stare at your lovely picture and know that Spring is happening somewhere. Dear Lucy, We live in Sussex in England and have just had a happy two days taking friends with us through the tunnel to Montreuil sur Mer. I saw the first Magnolia in bud just like your photograph. Another beautiful pic that makes me long for France and spring. What a fab idea re the branches. I think I will do just that this week! Lovely pic Lucy. In August 07 my son and I stayed in the Place des Celestins and our first meal (thanks to you) in France was under those cherry trees at Cafe Perl . Please could we see the cherry blossoms and I'd love to see more of the beautiful Place des Celestins in Spring. Great to hear from all of you. Jo, I will see you tomorrow, at our first photography group meeting! when blossoms open in cities, it is my favorite harbinger of spring. lovely.